I encourage my kids to make their own decisions and believe it is important that they learn from the mistakes that they make along the way. 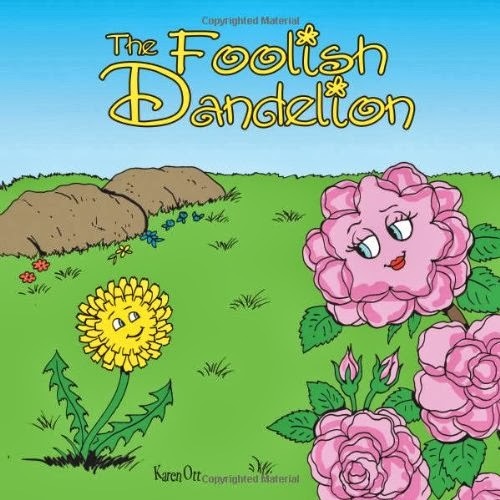 “The Foolish Dandelion ,” by Karen Ott discusses how bad choices can impact your life. The book is about a dandelion who lives in a garden near a rose bush. He notices that it looks like the grass is greener on the opposite side of the garden so he tells the rose bush that he wants to live over there. She explains to him that it just appears that it is greener over there. Instead of listening to the wise rose bush the dandelion makes a three day trip across the garden and plants himself on the other side. By the time he gets there his petals were starting to get old and he began to seed. He realizes too late that moving to the other side was a bad decision. I really like the concept behind this book, however I didn’t quite get the ending. When the dandelion turns to seed the book says, “The dandelion wished he had listened to the rose bush.” This statement brings closure to the story and in my opinion the author should have ended it right there. Instead she continues on with tow more pages which say, “The dandelion bent his stem toward the other side of the garden. A soft wind began to blow. It carried the dandelion’s seeds across the garden, dropping them near the rose bush, on the greener side of the garden.” Once I read this I wanted to hear more. What happened to the dandelion? What happened to his seeds? The author should have either written more about the dandelion and how he learned his lesson or she should have stopped the story before his seeds scattered. You can purchase a copy yourself and reach your own conclusion. For more information about Karen Ott visit thefoolishdandelion.com. You can also buy “The Foolish Dandelion online at amazon.com or your local book store. *Disclosure: I received a copy of “The Foolish Dandelion” in exchange for this review. All opinions are accurate and 100% mine.